This topic contains 7 replies, has 4 voices, and was last updated by John Cockman 1 month ago. 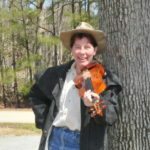 I’ve got Bluegrass In The Backwoods down (all the notes, but not to speed) so I’m looking for another challenge…. Dusty Miller anyone? I’ve got the sheet music, anyone have a link to a good video or even tabs (tef, whatever). This topic was modified 1 month ago by goettjp. The Dusty Miller has been on my ‘to learn” list for a couple years now…just never got to it yet. I haven’t researched it yet, so don’t have anything handy…good tune though. This reply was modified 1 month ago by fiddlewood. I am still trying to get Backwoods down. All was going well til I hit that measure with the real high F. I just don’t have that note. I tend to use Spotify and mostly the Kenny Baker versions of songs. . . then link then into my Amazing slow downer. Sometimes I start with an unknown group just playing the basic version of the song. I am hoping to get around to Dusty Miller. I wrote out the Fiddler’s Fakebook version in TuxGuitar (mando tab & notation). Is it possible to attach a PDF in this forum system? I downloaded it for future reference. Might mess around with it some later. Thanks!